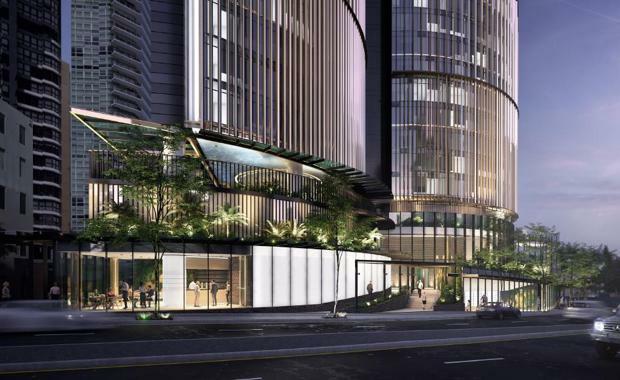 Brisbane’s $1 billion landmark residential and mixed-use development Queen’s Tower is actively seeking delivery partners following DA signoff from Brisbane City Council. The development at 545 Queen Street, encompasses world-class design, luxury residences, premium short-term accommodation and a new shopping and dining precinct, with construction anticipated to commence in 2018-19, once current building leases expire. Queen’s Tower Development Manager, PDS Australia executive chairman Sameh Ibrahim said the development approval demonstrated confidence in Brisbane’s residential market, with the site owner seeking delivery partners who also have expertise in developments of Queen’s Tower’s size and scale. “The team is incredibly excited to receive Development Approval from Brisbane City Council on this landmark project,” Mr Ibrahim said. “Queen’s Tower is a highly significant project for Brisbane, with the team looking for partners that have a track-record in high quality construction on developments of this size and scale. “The site’s owners have always maintained a strong commitment to delivering this project, and as a result, Brisbane is set to receive a landmark tower which has been meticulously designed, and one that will contribute to the evolution of Brisbane city. “There has been much debate around the apartment market, however we believe the transformation of this site, from commercial to a residential mixed-used precinct, will significantly activate the site and clearly aligns with the city’s projected growth. “Queen’s Tower will form part of the high rise residential precinct already established in the CBD’s north eastern corner, sitting on the 2,735m2 island site between Queen, Adelaide and Macrossan Streets. “Construction will commence once existing site leases have expired in 2018-19, and in the meantime office space within the existing building is available. 2,735m2 island site at 545 Queen Street, Brisbane (sits between Queen, Adelaide and Macrossan Streets at the north eastern end of the Brisbane CBD). 76-storey, 250-metre AHD building featuring 891 luxury residential one, two, three and four-bedroom apartments (including 14 three-bedroom sub-penthouses and three four-bedroom penthouses). Residents will have access to a private open-space podium roof deck with swimming pool and lush landscaping. 100 serviced apartments, with 80 one-bedroom (including studio configurations) and 20 two-bedroom apartments. Approximately 2,500m2 of street and podium-level retail and commercial space, including shopping, dining, a podium-rooftop café, and gymnasium. 853 car parks, 71 motorcycle parks and 752 bicycle parks, with designated car park spaces for residents, their guests, serviced apartment guests and retail/commercial visitors. Project team includes PDS Australia, Woods Bagot, Urbis, EMF Griffiths, TTM, Bornhorst + Ward, Certis, Bennett + Bennett and Butler Partners.